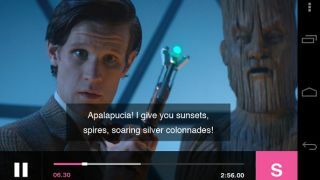 The BBC will release a new version of BBC iPlayer for Android using its new BBC Media Player tech next week. BBC Media Player is the BBC's way of getting around Adobe's canning of the Flash Player plug-in for Android; it'll ensure that iPlayer works on older Flash-friendly Android versions as well as newer ones like Jelly Bean. After considering the various options, including Http Live Streaming (HLS), the BBC decided that the app is the best way to continue to use Flash for the mobile iPlayer site and Android app. Chris Yanda, executive product manager at BBC Future Media, explained, "This approach allows us to focus on solving all of our media playback challenges in one place and in one app. Any improvements that we make will benefit everything in the BBC that uses the Android platform. "We are making this change with our eyes open. No technology is perfect. We've seen some of the challenges that other Adobe Air based apps have had in the marketplace and so we have worked hard, both internally and with our technology partners to build the best application we can." The new version of BBC iPlayer on Android should land next week, with "other applications and websites" to follow.